Boat Transport and Yacht Transport Specialists! "The number to call when you have a boat to haul!" Boat and Yacht Transport Shipping Experience! 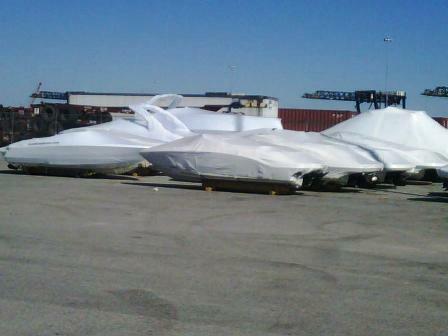 Shrinkwrap for Boat and Yacht Transport, boat storage, boat dry dock. Feel free to call or email us about your boat shipping questions, or information you need about Boat Shipping Cradles, Boat Shrinkwrap, Yacht Shipping or any other Boat Yacht Transport Shipping Service We Provide. Click here for Our Boat and Yacht Transport Gallery! We provide you a fair and honest transport quote for your boat or yacht either over the phone or online. We respond to your calls, emails, and quote requests promptly and continue with exceptional communication from our staff while your boat is being transported. Visit Our Boat and Yacht Cradle and Shrinkwrap Information page, Click here! We understand the importance of your boat and yacht to you and your family, and the value of selecting a boat and yacht transport company that you will recommend to your family and friends time after time. BoatandYachtTransport.com is highly qualified to transport, ship, and assist you with your boat transport and yacht transportation needs. Our company specializes in boat transport of all types of boats and yachts with emphasis on oversized, wide load boat transport. We are a family run boat transport business and our team of drivers have experience transporting boats for over 20 years, and are wide load boat transport specialists. We are well versed in transporting power boats, sailboats, and multiple loads throughout the nation. All trucks and trailers belong to me, and do not lease on to anyone. Our trucks stay busy, because we're the best! Schedule ahead to confirm your place in line. We will not cancel or delay a load that is booked and ready, for a "bigger-better-deal!" Loyalty of service is what brings you back to us, each and every time you move your boat or yacht. If our trucks are not available for the schedule you need, our partners may be available to assist. In all our years of experience on the road, transporting boats, we have established partners who we know to be the elite of our industry. Our elite boat transport partners proudly display our partner emblem on their trucks. Our company boat transport drivers and partners are experienced, professional boat haulers. Each driver practices safe boat transporting, possess their Transportation Worker Identification credentials (TWIC) card, and are licensed and insured. We are looking forward to providing you with a professional boat and yacht transport and shipping service experience. Feel free to call or email me if you have any questions or need more information.